The respectful refurbishment of this 1880’s old dairy with contemporary additions is balanced with a quirky furnishings strategy that bridges old and new. The interlinking series of spaces have their own meaning and character reflecting the art collection and personalities of the clients. Our client asked us to draw the original architecture and contemporary additions of this already spectacular period home into a harmonious whole. The scope of work included re-designing a number of the rooms – including the kitchen and bathrooms – with spacial planning determined by the client’s changing family needs. Rooms were repurposed to suit their current lifestyle. For example, a previous circulation space is now used as a gallery and formal dining room. New finishes and furnishings were selected throughout, adding layers of texture and colour to compliment their well-curated existing art collection and create comfortable spaces for extended family as well as more intimate areas. Our response to the building’s original dominant materials was to embrace the earth tones but mitigate with softer linking finishes and introduce furnishings that enhance each area with character, reflecting the personalities of the owners. This is clearly exemplified in the kitchen to gallery/dining room area where new floorboards unite the old and new. The mood and finishes of the new kitchen comfortably lead into the traditional formal dining gallery with reinstated period details, original fireplace and contemporary furniture, within a richly coloured and textured envelope. The living room situated off this area is furnished in rich hues yet restrained with a timeless luxury, allowing the art to be the focus. The success of this delightful project was to a large extent due to a trusting and collaborative relationship with our client who had a fantastic eye for art and furnishings. One of the challenges was helping our clients repurpose rooms to better suit their family of young adult children. The home theatre was graced with a sense of intimacy more suitable for two, whilst the billiard room was furnished to provide increased seating and a reading nook nestled in the deep bay overlooking the pool. 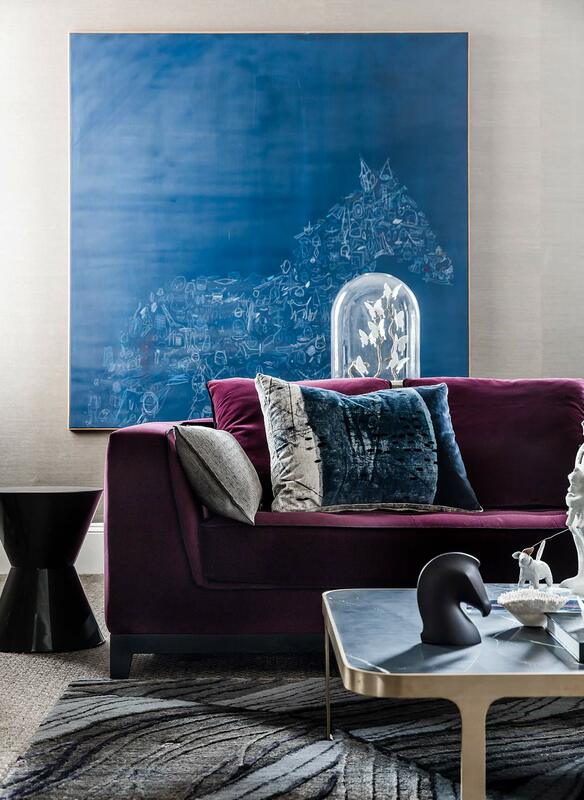 Furnishing choices responded to the scale of rooms adding personality, punctuated with delightful and quirky art, classic furniture and rich fabrics in sync with the client’s love of luxurious texture and colour. The children’s play and TV room were refurnished to provide a place for cozy winter conversations around the fireplace while cocooned in the luxury of velvet sofa’s by Maxalto. Informal dining was brought into the new kitchen design and a round dining table selected for casual family mealtime. Bedrooms have remained bedrooms but have been layered with warm tones, custom designed headboards and furniture, iconic lamps and luxurious linens and throws.